Is the Boise Area Seeing a Housing Bubble? Below is a market update from some local Boise lenders. 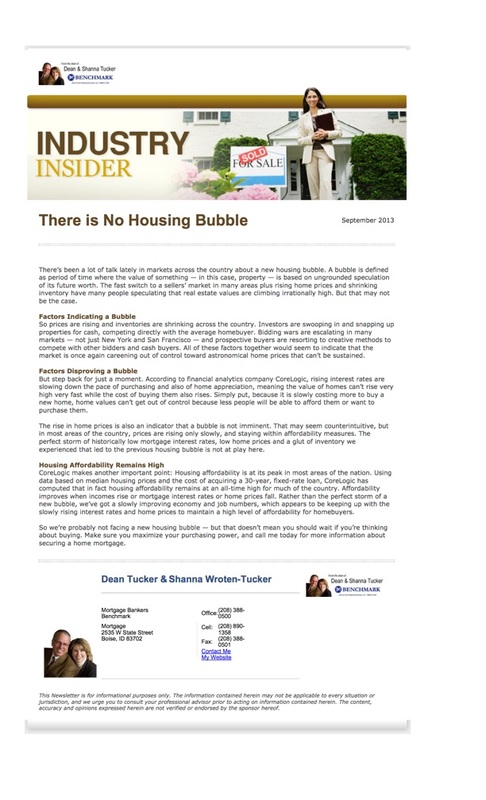 The article states that the fact we are seeing investors buying properties with cash, bidding wars, rising prices, and lower inventories are indicators that there should be another housing bubble. However interest rates have been rising which should be slowing the pace down along with rising prices. That may be the case, but in Boise, I am also seeing some investors who see the rates increasing, so they are now motivated more than ever to get something going. I guess you can call it a bubble, but I don't think it's a bubble that is going to burst. My guess, and that is all I can do, is that here in the Boise area we'll see things slowly come back to a normal market with normal activity again. Unless of course the feds play with other factors that seem to cause these huge market changes.